As President of Hershey Pharmacy and HersheyCare, Chuck has been faithfully serving residents and nursing home communities throughout the region for over 35 years. He earned his degree in Pharmacy from Duquesne University in 1975. Chuck, along with his exceptional staff, is known in the industry for providing outstanding customer service in both retail and long-term care pharmacy. His fundamental knowledge of the industry and commitment to excellence has taught him that the needs of every facility are inherently unique, and it is this understanding that sets HersheyCare apart from its competitors. Be sure to check out the other key staff at HersheyCare! We truly believe in the concept of a traditional “community pharmacy” and the unsurpassed level of personal care and quality service it is synonymous with. Whether it’s your daily delivery, med exchange, or an emergency question over the phone, your needs will be met by a member of our dynamic long-term care team. Patty Tomaszewski, R.Ph.—Patty has been practicing pharmacy for 29 years; 24 of those with HersheyCare, as an integral part of our team. She holds a B.S. in Pharmacy and is a member of the American Society of Consultant Pharmacists. 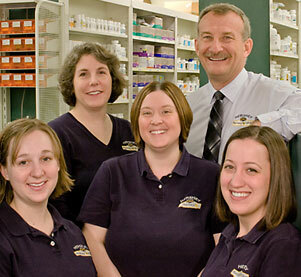 Mark Green, PharmD.—Mark has been practicing pharmacy for 8 years with HersheyCare after earning his PharmD degree. He has a wealth of knowledge and is also licensed to immunize. Kristin Green, PharmD.—Kristin has been practicing pharmacy for 7 years with HersheyCare after earning her PharmD degree. She has a wealth of knowledge and is also licensed to immunize. Chip Thomas, R.Ph.—Chip joined the HersheyCare team 4 years ago. He has an invaluable amount of industry expertise and is also licensed to immunize. Sheri Gunther, R.Ph.—Sheri has been a part of the HersheyCare team for 3 years. She has a wealth of knowledge and is also licensed to immunize. Amanda Edwards, R.Ph.—Amanda decided to join the HersheyCare team 3 years ago. She has a wealth of knowledge and is also licensed to immunize. Mark Jacobs, R.Ph.—Mark joined the HersheyCare team 3 years ago. He has a wealth of knowledge in consulting. Kelly Arndt, Pharmacy Technician & Data Coordinator—With 18 years of Tech experience (15 with Hershey Pharmacy), Kelly takes the lead on our data entry for all facilities. Myranda Barto, Pharmacy Technician & Billing Coordinator—Myranda has 15 years of experience with our team. She works closely with our homes to facilitate billing and payment, and is the main contact for residents or their responsible parties for inquiries regarding billing and coverage. Ashley Vuxta, Pharmacy Technician & Pharmacy Coordinator—With 19 years of Tech experience (8 with Hershey Pharmacy), Ashley serves as a primary point of contact for nurses and staff on day to day operations and takes the lead on our med exchanges and cycle fill team. Erin Boland, Lead Pharmacy Technician—With 10 years of Tech experience (3 with Hershey Pharmacy), Erin serves as a primary point of contact for nurses and staff on day to day operations and takes the lead on our med exchanges and cycle fill team.